[Update] Today(24th October 2012) Skype made the following beta features available to all users via a major update which upgrades the build for Skype for Windows to 6.0.0.120 and Skype for Mac to 6.0.0.2946. The upgrade can now be installed via Skype Upgrade or simply by downloading the latest version from their site. 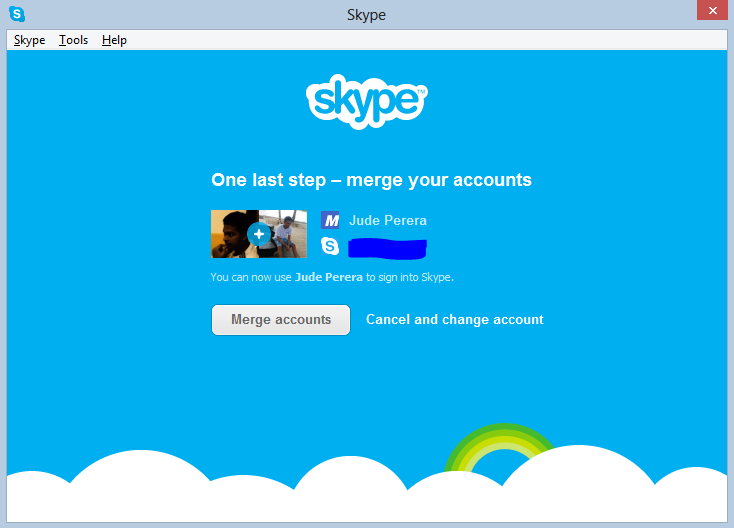 Also, Skype is to release the ‘Metro’ or ‘Windows 8’ version of Skype on 26th October. Skype and Microsoft, the story continues. After Skype app mistakenly getting its way inside the Windows Update Service recently, this new feature brings back some good news of Skype and Microsoft Services integration capabilities. Well, the integration is pretty straight forward and it’s all about ‘merging’ of your Microsoft Account with your Skype Account. So what you’ll be getting is all your Messenger contacts along with your existing Skype contacts. But mind it, this feature is currently available on Skype Build: 5.11.0.102 beta. So unless you really really want to give this a try, it is always advised to stay for a stable release. Sharing Instant Messages with friends with Messenger You can now sign in with your Microsoft account (formerly Windows Live ID), and see presence as well as send and receive IM messages from your friends who are using Messenger, Xbox, Hotmail or Outlook.com. Improved Facebook integration You can now sign in directly with your Facebook account log in, without needing to first create a Skype account. Support for 6 new languages We are excited to support our growing community around the world with new localized versions of Skype in Thai, Croatian, Slovenian, Serbian, Catalan and Slovak, bringing the total languages Skype supports to 38. In addition, we have added new features and minor improvements to improve usability of the Skype for Windows client. Sign in with a Microsoft or Facebook account.You can now sign into Skype directly using a Microsoft or Facebook account, without having to first create a Skype account, making it easier to connect with friends on Skype without needing to setup a new Skype account. Link Microsoft and Facebook accounts to a Skype account.If you sign in with a Microsoft or Facebook account you will be offered the option to link your Skype account. If you choose the link option then Skype will display a combined list of friends. This is an area we are still working through so please let us know about your experience. Updated visual design.We have refreshed and flattened the Skype UI with a simpler and less cluttered look. Removal of the online user count.We have removed the online user counter at the bottom of your Skype Contacts list to unclutter the UI and make more space for your friends within the contacts list. Display previously created profile pictures.When you change your profile picture, we will now show you all of your previous Skype profile pictures so you don’t have to look through old files if you want to use a previous image. Improved telemetry.We are constantly looking for ways to improve the quality of our product. To that end we are adding additional “opt-in” telemetry reports for users who choose this option: “Tools>> Options>>Advanced>>Tick “Help improve Skype…” The reports may contain your Skype ID and or Microsoft Account ID but we will not use it to identify you or contact you. Thank you and we look forward to hearing about your experiences. Note: To know about more info and known issues with the beta, please visit here.